Pushing for Uncollected - Rank Up Help Please.. 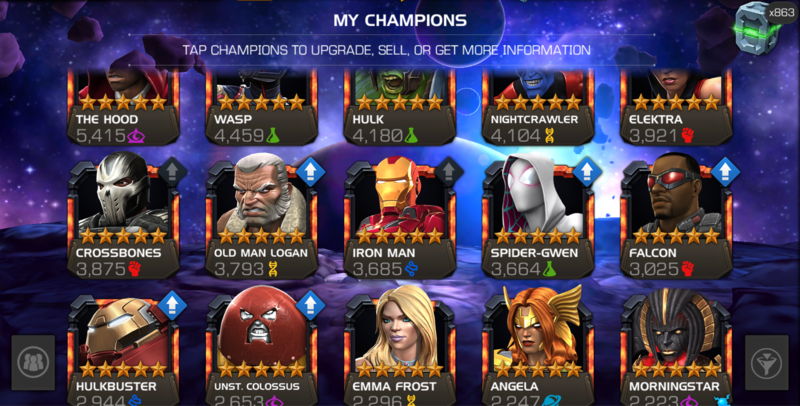 I'm going for uncollected and just popped a few 5* crystals. Based on my current 5*'s, who would you guys suggests I rank up to help me out?? Emma Frost, Angela, Hood, Gladiator Hulk and Crossbones are worthy indeed from everyone I would have said Morningstar but you havent duped her yet. Emma's good unduped as well when shes awakened you can use her inverted controls. As for spider gwen i say bench her till she turns out to be good after her update. 6* Nightcrawler was the main counter for me. He dealed 50% of the Collectors’ life, making me finish him without using revives on the last run. It’s the only quest he’s been really useful though.